GE Renewable Energy (NYSE:GE) today launched its new onshore turbine platform, named Cypress, and the next model from that platform, GE's 5.3-158 turbine. The platform advances the proven technology of GE's 2 MW and 3 MW fleets, which serves an installed base of nearly 20 GW, while also utilizing architecture and innovations from the 4.8-158 turbine introduced in 2017. Cypress enables significant AEP improvements, increased efficiency in serviceability, improved logistics and siting potential, and ultimately more value for customers. It is designed to scale over time, enabling GE to offer a wider array of power ratings and hub heights to meet customer needs throughout the 5 MW range. The platform also offers up to a 50 percent increase in AEP over the life of the platform versus GE's 3 MW turbines. It is the second major technology platform launch of the year for GE, which introduced the Haliade-X offshore turbine platform in March. The Cypress platform, which also includes the 4.8-158, will be powered by a revolutionary two-piece blade design, enabling blades to be manufactured at even longer lengths and improving logistics to offer more siting options. 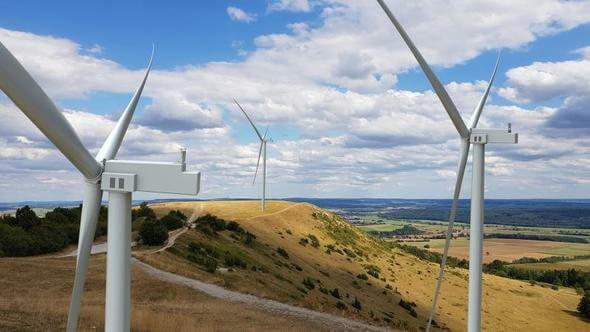 Longer blades improve AEP and help drive down Levelized Cost of Electricity (LCOE), and the proprietary design will allow these larger turbines to be installed in locations that were previously inaccessible. It significantly drives down logistical costs, by enabling blade assembly onsite and reducing the costs for permitting equipment and road work required for transporting longer blades. Equally importantly, it features blade tips that offer customers greater flexibility to address site wind conditions and requirements. The high-tech carbon blades were developed through the longtime partnership between GE's Onshore Wind business, GE's Global Research Center and GE's LM Wind Power, taking advantage of the research, design and large-scale manufacturing expertise of these teams to bring the blades from concept to a tested and proven reality. The Cypress platform, designed for IEC (S) wind speeds, leverages the best of GE's 2 MW and 3 MW turbines – including the proven DFIG - doubly-fed induction generator – and a robust drivetrain architecture. The machine is specifically designed for services, with enhancements to help with facilitating up-tower repairs and troubleshooting with its up-tower electrical system, while also pushing the limits of traditional reliability levels on major components, through increased systems level hardware testing and more robust manufacturing processes. This combination of planned, condition-based and predictive services will help to ensure more reliability, uptime and production while ultimately lowering lifecycle costs for the customer. Pete McCabe, CEO of GE's Onshore Wind business said, "Our mission is to enable our customers to set the pace for lowering the LCOE around the world, as their needs continue to evolve. The Cypress platform builds on our track record of success and positions our technology for scalability and flexibility for the coming years. The prototype Cypress 4.8-158 is currently under production at our Salzbergen, Germany facility and we are looking forward to deploying and commissioning it by the end of the year. This platform, which reflects our relentless focus on quality, will enable our customers to achieve a new level of competitiveness in the power generation marketplace." Duncan Berry, CEO of GE's LM Wind Power said, "This exciting blade enhancement is revolutionizing the offerings that we can provide for GE's customers. Our team used a disruptive design methodology and customer feedback to re-examine our entire design and manufacturing process. By looking at this blade in an entirely new way, we achieved a technology breakthrough that will allow us to bring the new blades to market even faster for our customers."